I did some experiments with Photoshop. This is how a possible blue mutation would look like. To be perfectly clear, this is an edited pic. No, nothing at all on this side of the planet. I have had sort so tempory results. 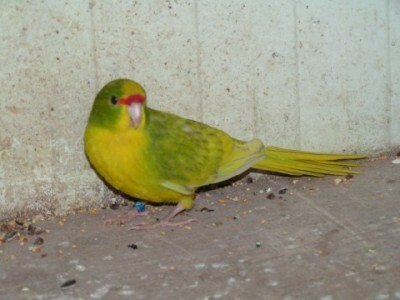 He was breeding as well the opaline mutation. 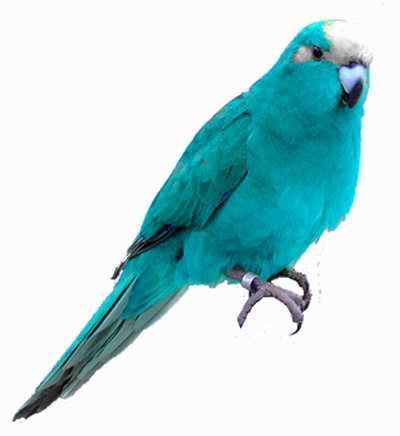 There used to be another guy claiming a friend of his had blue kakariki as well, but he sent me that photoshop picture Peter has on his website. When I told him that picture was actually Peter's work simply to explain about pigments... he started to retreat but never admitted he made a mistake. Funny guy. Honestly no... no news about new mutations. There's a picture I received of a yellow fronted, but to me it looks like a simple pied. It's said it's an opaline mutation, but funnily who told me about it, told me it's autosomal recessive. he even offered me kikes from Rob Opbergen but I contccted Rob and he told me Lucas never bought him anything. Here some pics from a Dutch breeder. A German breeder told me by email, like Pablo mentioned, that it is of a autosomal recessive nature. I have a basic 'libarary' of acvived documents of ealy settlers in NZ about kakariki, and believe Peters is far more extensive in his reasearch than mine.  But I cannot remember or find anything on a blue mutation being mentioned...or anything that may relate to such possiblity. Im rather bloody minded about most things, unless I have seen, or done myself, or to a lesser degree been told 1st hand by people I know of high integrety...I tend to put in the BS folder...urban rumour. Like the red meantioned and photos on this web site...even with photos I still remained sceptical as I did not at that time know the person. It was not till I went to Australia and actually saw the kakariki I could actually claim it existed. 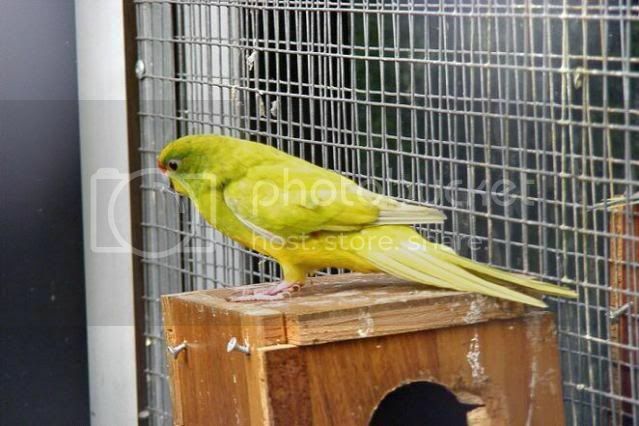 It was the same person at the same time, who had acquired a very scruffy, ill health bluish kakariki...also pics on this web site...which I have seen. It died not long afterwards our veiwing it. In all honesty..yes it looked like a genuine blue mutation, but I do have to question as to was this caused by some sort of illness or factor? My knowledge doesnt go far enough as to if sickness , ill health or some other factor could have caused the colouring. I can say, and mean no disrespect....If I got a pied or similar, washed (not sprayed) it in food colouring or maybe some sort of dye that broke down the oils and structure of the feathers, the bird would look just like the pics and the one I saw. There are some other unrealed factors since then that Catts and i have corosponded on a while back that also could relate to a strong sence of doubt... too many coinidences. In feathers of the structual type there are 3 elements present which are responsible for the final color. Psittacin(red and/or yellow pigments), melanin (black pigments) and featherstructure (blue). Together they form the green colouring. Most of the feathers on the body are of the structual type. In feathers of the ornamental type there are 2 elements present. Psittacin red and/or yellow) and mellanin (black pigments). These feathers are mainly found on the head. Red or yellow crown. A genuine blue mutation lacks the psittacin pigments (red and/or yellow). Structual feathers will look blue. Ornamental feathers will look white, greyish white or grey depending on the amount of mellanin present in the feather. A genuine Aqua mutation has a 50% loss off psittacin.  As a result it has a seagreen appearance. The crown of a red will look orange. Those of a yellow will look pale yellow. A genuine Turquoise mutation has a irregular loss of psittacin (red and/or yellow). Psittacin loss will vary from 80-90% on the body to 50-60% on the wings. The crown of a red will have a light pink shade. I tend to suppose this bird corresponded with a genuine Turquoise mutation. That bird differed with the descriptions of blue mutations as mentioned above because all bodyfeathers were affected except the crown. So, no mutation. Malnutrition is a possibility. - Arginine deficiency may cause wing feathers to curl. 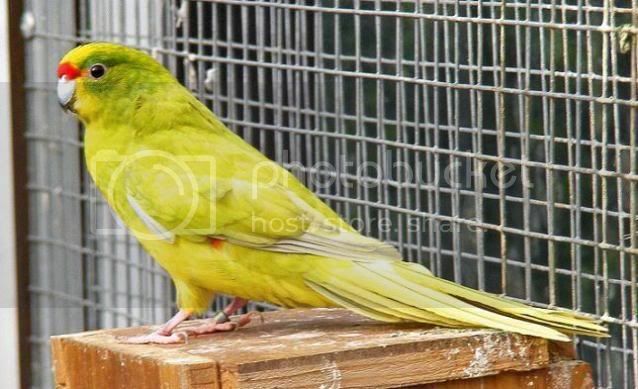 - A change in feather color green to yellow is usually caused by a loss of structural blue color which may be associated with essential amino acid deficiencies. Feather color may change blue to black, green to gray to black that are sick or malnourished. 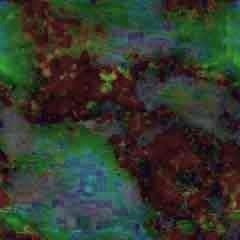 Color change is associated with altered keratin structure in the spongy layers that prevent normal light scattering. Melanin granules in the middle of the feather if present would absorb all wave length of light. Giving the visual effect of black. - Copper deficiency can interfere with melanin production and cause dark colored feathers to become lighter. feather should be considered abnormal. Possible cause: organopathy, toxins, malnutrition, bacteria, viruses, fungi, parasites (blood or intestinal), boredom, anxiety, lack of sleep, psychosis, sexual frustration, hormonal, molting abnormalities. - Deficiencies in the B vitamins riboflavin, have been associated with abnormal pigmentation of cockateils. From the info and descriptions above. Also such diet defiiencies would result in a sickly looking bird, in poor health and most proberly a shortened life span....Which it was. Sadly I still have to agree and come to that conclusion. I'm sorry for the mutation breeders, but if there come one, it's the final dead of the wildcolors. Look and watch, this is a Rob van Opbergen bird and sits in my avary . He can pair common year with some of my hens, and some hens can pair with my males. Both bloodlines will come together. I wonder what is coming out . It is my understanding kakariki mutations where sort out in the mid to late 1800s because mutations where very common in flocks. IF Buller is correct (Peters quote above) and Buller in my opinion was very correct in his documentation /research, AND A blue mutaion was included, The gene would be somewhere in in the Belgian or German blood line history. IF it survived. Nevertheless... awesome bird Peter, I hope it yields good breeding results for you. I'm not sorry for the mutation breeders, I mean... the sloppy ones. But nevertheless... if you take a look at budgies, cockatiesl, lovebirds... wildcolor is already finished. And kakariki, I visited a fair this weekend, and +90% were goldcheck hybrids already, so I don't know if a new mutation can really harm kakariki more than has been done. In fact I hope the opposite might happen. I think maybe if a new mutation shows up, breeders become more aware and at least some more serious breeders get attracted to the species. If you look at agapornis, indeed... many sloppy breeders are still breeding hybrids, transmutations, etc... but on the other hand, the species became more popular and some more breeders are getting serious at it, and more dedicated. Even neophemas and catharinas (lineolated) people is starting studygroups and along with "lazy" breeders, some people is getting serious at it. Same with cockatiels. Few weeks ago an old time breeder, in a Spanish forum, in a thread about albino cockatiels said: "if cockatiels were white, and we had a mutation consisting of a grey bird, with yellow head and orange cheeks, people would be wanting that bird and paying lots of money". The only problem that I see is that probably in the beginning the blue mutation will be really expensive, so maybe by the time it's available for some of us that are concerned about breeding properly, the damage will be already done. I just hope the mutation comes to good hands soon enough, like some cockatiel mutations that Thierry Duliere is working on. Steps, interesting point of view. I hope you are right. 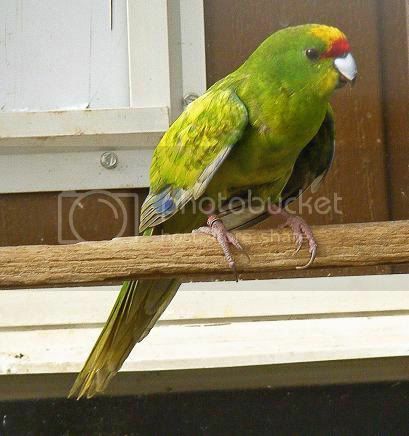 Jump to: Select a forum General----------------Forum Rules And 'How To...'Member DiscussionPublic DiscussionGeneral Non Kakariki Discussion Kakariki in Captivity----------------Kakariki General CareKakariki Breeding in CaptivityKakariki Mutations and SpeciesVets CornerAviaries, Flights and CagesKakariki Pets CornerMarket Place Kakariki In the Wild and Reference Material----------------Native Ecology and Dept of Conservation, NZKakariki ReferenceWild Kakariki Sightings? Standalone Developed Tested by: ChatServ, mikem, and Paul Laudanski (aka Zhen-Xjell). Statements and Views Expressed on this web site Represent the Opinions of the Authors. Web site engine's code is Copyright © 2003 by NukePortal. All Rights Reserved. NukePortal is Free Software released under the GNU/GPL license.